A single sensor is scanned circumferentially on the pipe to measure reflections up to 3m-10’ in front of the sensor. The technique is mainly used for detection of corrosion under supports (as a complement to the axial inspection technique), inspection of lamp posts, inspection of air-to-soil or air to cement interfaces or any area where the pipe or structure is not accessible. 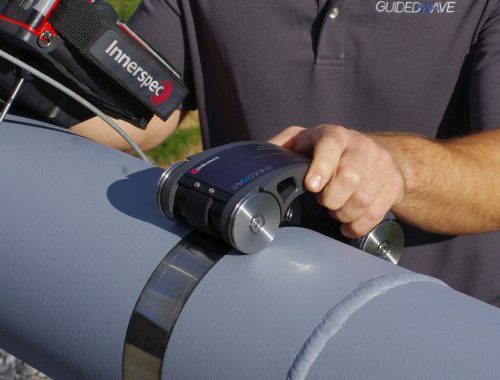 Circumferential scanning provides axial inspection of the pipes. Complements circumferential scanning when the pipe is accessible. Different wave modes permit penetration under cement and any type of coating. Complements LRUT by providing accurate detection from 75mm (3”) to 3m (10’) in front of the sensor. Available for pipes up to 1” in thickness. Detects corrosion and pits as small as 1/10th of pipe thickness.